Seattle Burlesque Games return for another round. 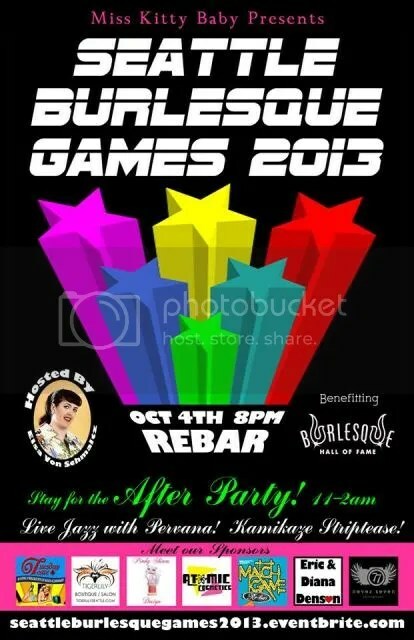 Get ready for some campy displays of athleticism and cheeky competition at Re-Bar this Friday night as the Seattle Burlesque Games return for a second year. The show is produced by Miss Kitty Baby – an active supporter of the Burlesque Hall of Fame, which this show benefits. Miss Kitty Baby is also a huge champion of recognizing and honoring our burlesque Legends and of the importance of the Burlesque Hall of Fame, the world’s only museum dedicated to preserving their history. POC: What was your experience with last year’s Seattle Burlesque Games? KITTY BABY: We came up with last year’s idea on a whim and it turned out to be an incredibly fun community builder and the audience went wild. I was just so impressed with how well everyone came together to make it run smoothly. It was a big pile of fun for myself, the performers and the audience. As it should be. POC: Is there anything different about this production than last year’s show? KITTY BABY: This year we are adding the After Party. We have the Re-Bar for the whole night so we aren’t as restricted with time. This will allow us to splash around in the Games a bit more. With the added excitement and interest after last year’s show, I think the performers will take it up a notch. The after party will be live jazz by Pervana (the Tuesday Tease band) and a cast of kamikaze strip teasers. They won’t know what songs they are dancing to or the show order. It’s not a competition, but it’s definitely challenging and fun. Oh and thanks to Babe of Belltown, this year we have a five and a half foot trophy for the Ultimate Grand Supreme winner. …It’s really inspiring to see 46 Seattle burlesque performers and musicians come together in the name of community and support for the Burlesque Hall of Fame. It makes my heart happy to see such incredible support from the performers, our audience and our sponsors. Pixie Parcelle, Lady Drew Blood, Bunny Von Bunsmore, MeMe La Saint, Flirty Sanchez, Sailor St. Claire, Cherry “Killer” Tomatoes, Whisper De Corvo, Miss Violet DeVille, Scarlett O’Hairdye, Stella D’Letto, Kutie La Bootie, Karmen Sutra, Man Johnson, Sabina Soubrette, Solange Corbeau, Holly Bordeaux, Huney Bush, Eddie Van Glam, EmpeROAR Fabulous, Dahlia Ste Cyr, Waxie Moon, Boom Boom L’Roux, Lord Richard Longfellow, The Kentucky Dandy, Candy Apples, Dinah Takitov, Queenie O’Hart, Elsa Von Schmaltz, Palomita Mar, Red Delicious, Tamara Trapeze, Dizzy Von Damn, Olatsa Assasin, Cherry Tart, Persephone Illyri , Dessi Devine, Sara Dipity, Jenny Brown, Morgan Gilkeson,Tyson Lynn and Britton Bangs. Click HERE for event details and ticketing info, and click HERE to visit the Burlesque Hall of Fame. ~ by angrytruffle on 10/01/2013.